I must admit that I was inspired to start this blog after seeing that my cousin Rachel had started her beautiful blog called A Little of Everything. We used to just post pictures of our cooking adventures on Facebook, but now everything just goes into our blogs. 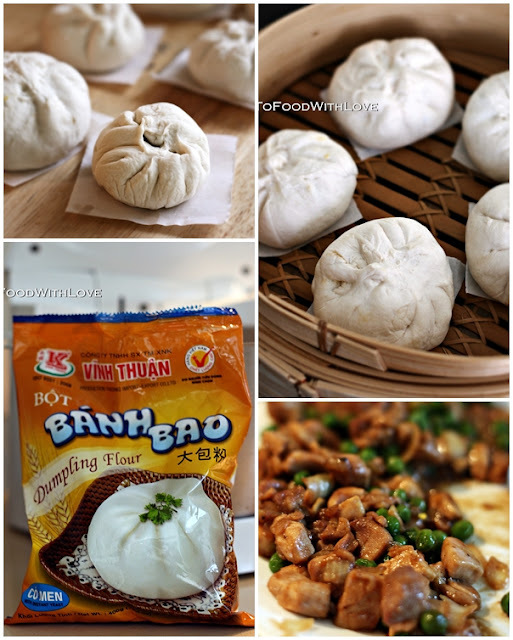 She recently attended a pau (chinese steamed bun) making class and made these tasty little barbecue chicken buns. They are like char siew buns, but using chicken instead, and I could just imagine how delicious they were. I was planning to make them soon, but it looked like a pretty quick and simple recipe that I decided to just make them today. Anyway, I was keen to try out the Dumpling Flour (see picture below) that I bought last week, as my previous attempts to make pau with regular flour ended up with yellowish-tinged buns. These buns turned out fantastic (besides the pleating which needs more practice)! The bun itself was mildly sweet with a good texture, and the filling was sweet, savoury and very tasty. I also added pieces of hard-boiled egg to the filling for something a little extra. I had some of the filling leftover, which the children enjoyed eating with steamed white rice for dinner. You can just cook the filling and serve it with white rice if you don't want to make the buns. Like I say, it's just chicken char siew, and the little cubes of chicken are perfect for little mouths! And the buns were such a big hit with the family that there were only two left by the time we had some for supper! Combine chicken with the salt, white pepper and cornflour and mix well. Heat up 1 tbsp vegetable oil in a pan. Fry the garlic and onions for 1 minute, then add the chicken and fry until almost cooked. Add the peas, hoisin, oyster sauce, soy sauce and black pepper and toss until chicken is cooked. Add sesame oil and sesame seeds last, and dish out onto a plate to cool completely. Dough: Prepare the dough according to instructions on the packet. Cut a few square pieces of parchment paper for steaming the pau. When the dough is ready, roll it out and divide into 12 pieces. Roll out each piece with a rolling pin on a floured surface to get a round disc. The edges should be thinner than the centre of the disc. Place the dough in your left hand and place some filling and egg in the centre. Cup the dough in your left hand while using your right hand to bring up the edges to form pleats around the top until the filling is enclosed. Seal well and ensure there are no holes. Place it on a piece of parchment paper leaving about 1 cm edge around the pau. Repeat with the rest of the dough. Prepare the steamer by bringing some water and 2 tbsp vinegar to a boil. The vinegar helps to produce whiter buns. Then place the pau over the steamer and cover. Steam on high heat for 20 minutes until cooked. Remove from steamer and serve hot or warm with some chinese tea. I just stumbled upon your blog while looking for pork trotter with peanuts recipes. O my! what a blog. I've tried quite a few of your recipes and they all WORK!!! Plus you explain the steps and other additional information so well and so clearly. You are the best food blog I found so far. I'm just surprised that you don't have many comments. Food lovers must be blind to not realise what a jewel your blog is. While I'm writing, my pull apart buns are in the oven and they are looking so good. Your recipes are so accurate, I can't go wrong as I follow them. Many other food blogs I have to adjust their recipes. Either they are not honest or their recipes may not have been tested well. Anyway, you keep up this great blog! And thanks so much for sharing your talents and secrets. The world is a better place with generous food lovers like you! God bless! May I ask how much yeast to use. Is the texture of the pau very soft?